It is my plan that when I write about a book, I want to just briefly tell you guys how it somehow entered my life. I just think it is important–there are so many books, SO many books, available at once, and in so many places: Barnes and Noble (or the one Borders left), indie bookstores, libraries, garage sales, thrift shops, Urban Outfitters (for some reason), grandma’s house. You invest your time and yourself in books when you read them–like a relationship (I know I am being cliche here). The first thing you ask a couple is, “So how did you meet?” You ask about the coincidence, or the right-place-at-the-right-time thing. For most readers, their relationship with books is so special, that such information deserves some attention and contemplation. Well I want to answer that question when it comes to books–if only to acknowledge my own situation as a reader, setting a tone for my review. But also to help others discover ways to find their next books, to discover ways to create more coincidences. So here’s to that with my first “official” blogger book review! Recognizing that I should read more work by contemporary female writers, instead of just flocking to Virginia Woolf or Kate Chopin, a friend of mine suggested that I read stuff by the young Karen Russell. At the age of 30, she has already had stories featured in The New Yorker, Zoetrope, The Best American Short Stories, Granta…among other big names. Russell has also been named to The New Yorker’s “20 Under 40” list and is a Granta Best Young American Novelist. 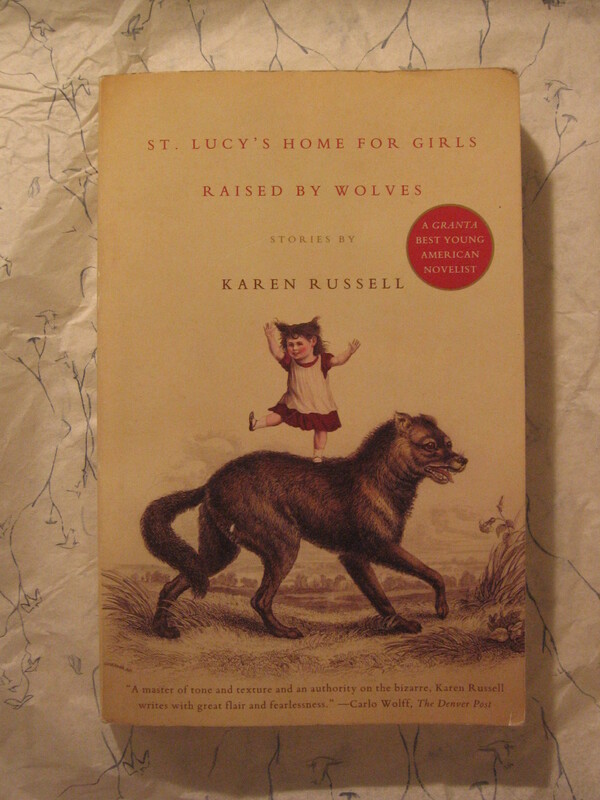 Yet it wasn’t necessarily her status that captivated me–but the title of her story collection: St. Lucy’s Home for Girls Raised by Wolves. In the title, I sensed this warmth of childhood, my nostalgia for reading stories of ghosts and werewolves in my bed and being too afraid to go to sleep, watching Goosebumps, and thinking Halloween was the greatest day of the year. Russell certainly delivered childhood. Each story in this collection either involves a child protagonist or at least includes a child’s perspective. They are stories where animal ghosts exist, where boys have pioneer Minotaurs for fathers, where girls still youthful with baby fat get stuck in giant conches, where feral children brought up by their werewolf parents must learn how to stand up straight and become human. And more. In these stories is surreal uniqueness. Russell has innovatively given the supernatural and paranormal some more integrity and I think she achieves this through her matter-of-fact style. She hardly explains why a girl’s sister is possessed by a spirit, or how a boy wearing magical goggles can see fish ghosts under water. In the stories, Russell treats these details as simple facts. Because of this, I didn’t even have to willingly suspend my disbelief. The stories did that on their own. Although I loved Russell’s writing, and knew I would from the start, I do take issue with one aspect of her style–her random SAT words. The stories have believable child protagonists and I applaud Russell for avoiding the trap of creating child prodigies who are too wise for their teddy bears. I feel like it is too easy for adult fiction writers to do this when dealing with young characters. Russell skillfully maintains childhood’s innocence, its matter-of-factness about life, and its naivety. Except when she includes words like “perfunctory,” “epithets” (which I KNOW was in my high school vocab book), or “soporific.” Maybe I’m just bitter, though, because I’ve been told my language is too sophisticated for my characters at times. I look forward to reading more of Russell’s work–namely her debut novel Swamplandia! (yes the exclamation point is in the title).